Has bin Laden already won? 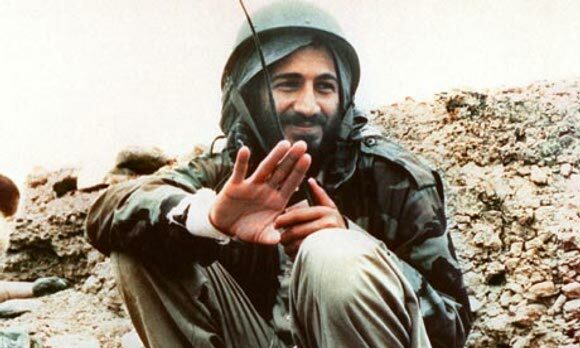 Osama bin Laden in 1989 in Afghanistan. Osama bin Laden is dead. You’ve seen the news. US troops stormed the mansion where he was hiding, an hour’s drive from Islamabad, in the backyard of Pakistan’s elite military academy. President Obama came on TV last night and announced—victoriously, but without much bravado—what he described as “the most significant achievement to date in our nation’s effort to defeat al-Qaeda.” He called for unity, like the country experienced after 9/11, when George W. Bush’s approval ratings were soaring. There have been celebrations in the streets of US cities. The stock market even got a spike. But what is there, really, to celebrate? The death of a man? The end of the war on terror? Celebrating becomes tough when you considers the cost. Bin Laden’s persona has been the totem justifying US war policy since 9/11. The idea was to get ’im, dead or alive. Soldiers have been taught to fantasize about someday nailing him, issuing the payback that he’s had coming since 2001. Politicians have promised his head as the ultimate prize. To that end, there was an invasion of Afghanistan almost ten years ago now, which started a war that is now bloodier than ever. (The CIA reports that there are fewer than 100 al-Qaeda operatives in that country.) Then there’s Iraq—a country that the US invaded while giving various elusive reasons, most designed to somehow link Iraq to the bin Laden totem in people’s imaginations. The cost, exactly? There have been as many as a million people killed in Iraq, Afghanistan, Pakistan, and elsewhere. More than $1 trillion of US money down the drain. And for what? Ask the architects of this war on terror, and they’ll say that all the armies, and the air strikes, and the torture chambers have been rooting out al-Qaeda and global terrorism for good. But, if you could ask bin Laden today, or yesterday, he might have smiled. We responded exactly as these terrorist organizations wanted us to respond. They wanted us to speak the language of violence. … These groups learned to speak the language we taught them. And our response was to speak in kind. The language of violence, the language of occupation—the occupation of the Middle East, the wars in Iraq and Afghanistan—has been the best recruiting tool al-Qaeda has been handed. Bin Laden was a purveyor of chaos, a master of turning murder into spectacle. One can only hope, for the sake of our own sanity, that he was a madman. But, in certain respects, he also seems to have understood the nature of violence far better than the American foreign policy establishment. He understood how easily it slips and kicks out of any pretense of controlling it, and how addictive it can be for those who like to think of themselves as holding its reigns. The US economy, since 9/11, has gone from boom to bust, and from surplus to debt. Few dispute that the country seems to be lunging toward decline, at least by standards like the perception of its military abroad and the invincibility of its industry. China is sopping up the big contracts in Afghanistan. Yet there are more Coalition troops on the ground there now than ever, and less hope for any meaningful victory—except maybe for China. Whether one approves of such an assassination or not, the “decapitation” strike against bin Laden last night only drives home how beside the point the wars in Afghanistan and Iraq have been. Bin Laden wasn’t hiding in a cave in Tora Bora. He certainly wasn’t consorting with Iraq’s Republican Guard. He was living, quite comfortably it seems, right under the nose of the Pakistani government, which has received billions of dollars in US military aid since 9/11. One wonders whether, absent the chaos of two distracting and self-destructive wars, finding the perpetrators of the September 11th attacks like bin Laden might have been easier—if, rather than blowing up the whole neighborhood, or the wrong neighborhood, the US and its allies had simply focused on finding the crooks. Perhaps the only thing that can really count as good news about this, though, is how irrelevant bin Laden has become. The Arab Spring uprisings around the Middle East have shown that the way to create change for the better in that troubled region, and elsewhere, is neither chaotic terrorism nor superpower interventionism. It’s the power of ordinary people, standing up against unjust regimes peacefully, creating a future that refuses to accept the logic of violence, or to equate power with weapons. The protesters in Tahrir Square did more to defeat what Osama bin Laden represents in a few weeks than the whole US military and intelligence and political outfit has managed to do in nearly ten years. Nathan Schneider is an editor of Waging Nonviolence. His first two books, both published in 2013 by University of California Press, are Thank You, Anarchy: Notes from the Occupy Apocalypse and God in Proof: The Story of a Search from the Ancients to the Internet. He has written about religion, reason and violence for publications including The Nation, The New York Times, Harper's, Commonweal, Religion Dispatches, AlterNet and others. He is also an editor at Killing the Buddha. Visit his website at nathanschneider.info. I certainly agree, especially with your final paragraph. One has to wonder: why was bin Laden killed now? Was his convenience as a villian at large seen as outlived, now that People Power has illuminated the failures of both terrorism and military occupation? Assassination is wrong, illegal and counter-productive. It’s vengeance, not justice. If bin Laden’s whereabouts have been suspacted or known for so long, why wasn’t he arrested and tried in an international court? I have to conclude that US politicians did not want the truths of his life aired — perhaps, as you suggest, because of his past associations with the US. Whether or how bin Laden was involved in the Sept. 11th attacks are now unlikely to be fully known. The only men who were guilty beyond doubt were the hijackers who perished in the attacks. A trial could have shown the extent of bin Laden’s involvement. Family members of the victims deserved to have known, not to have the truth buried at sea. The Times reports that the administration claims they hoped to capture bin Laden alive, though one can’t help but wonder about that, considering how inconvenient a major trial might be. (They also note that Peru’s president credited the event to Pope John Paul II, whose beatification was one year ago yesterday.) Bin Laden’s location appears to have been known, to some degree at least, since last September, so questions of “why now?” certainly seem legitimate. I imagine that more information about the planning and “execution” of this will emerge in the coming days, and then more in the coming years. Until then, it’s probably best not to speculate too much on motives. There is no doubt in my mind that UBL was executed. He met his end from a double tap at short range. He was unarmed. The men that conducted the raid are some the best in the world. They wouldn’t have killed him unless he was a threat or they were ordered to.